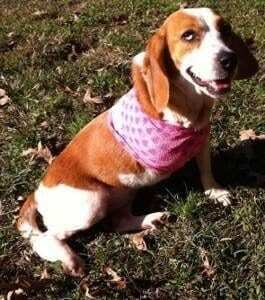 Kim lives in Hillsborough and has been fostering beagles since 1998! Kim wrote: “What has 17 legs, 5 snouts, and 6 big hearts? The answer is Me, my four beagles, and my foster beagle, Mama. I have been fostering beagles since 1998. In that time I have fostered over 40 awesome beagles who all found their forever homes. Working in EMS I am familiar with rescuing people which is the perfect companion profession for animal rescue. I live with my four beagles in Hillsborough. Often called the Northern Hillsborough Dog Park, my beagles and foster dogs enjoy 3/4 acre fenced dog play area. My friends and family often refer beagles in need to me for help. My beagle family loves to meet new beagles and welcomes the temporary family member as one of their own. I am so happy watching a beagle use the doggy door for the first time, enjoying a comfy bed, snuggling, and watching trust grow. Most people think it must be hard to foster and say goodbye when the time comes, however I love the excitement of the new family, and proudly know that my foster is going to be the center of attention and will receive much love and care. Thank you Kim for you many years of dedication to the beagles!